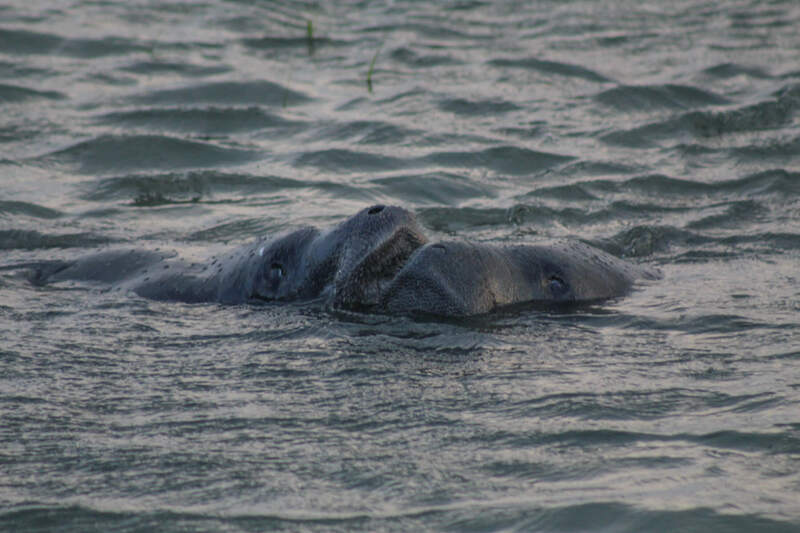 As storm clouds threatened to provide island residents with some natural fireworks last night, a manatee named Goose calmly meandered the creek outside the rice trunk with some friends. Goose, who was rescued from the Cooper River in December, malnourished and struggling to survive in cold water, spent the winter rehabilitating at Sea World in Orlando. He was released at Merritt Island in Florida on March 10. By May, he had been reported in Lowcountry waters. Island residents spotted him in the marsh on the other side of the crab dock. 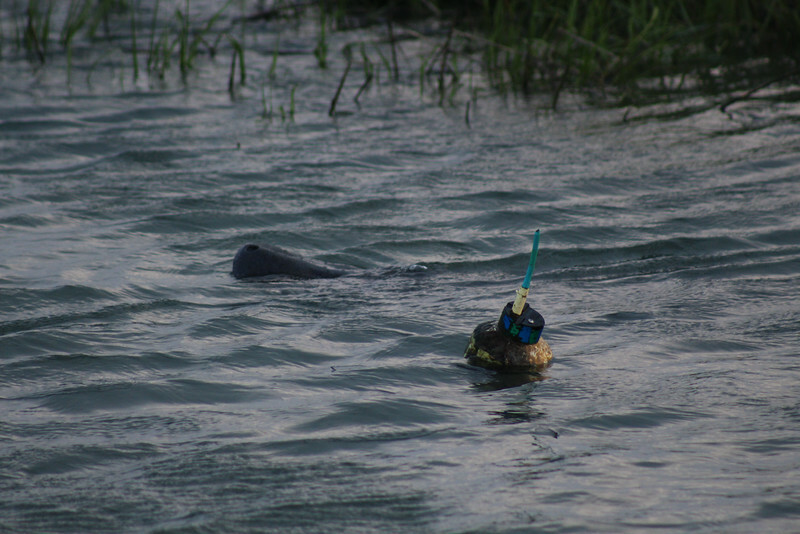 “Goose” with transmitter (photo by Emily Fairchild) If you see this manatee with this transmitter, it is not entangled. 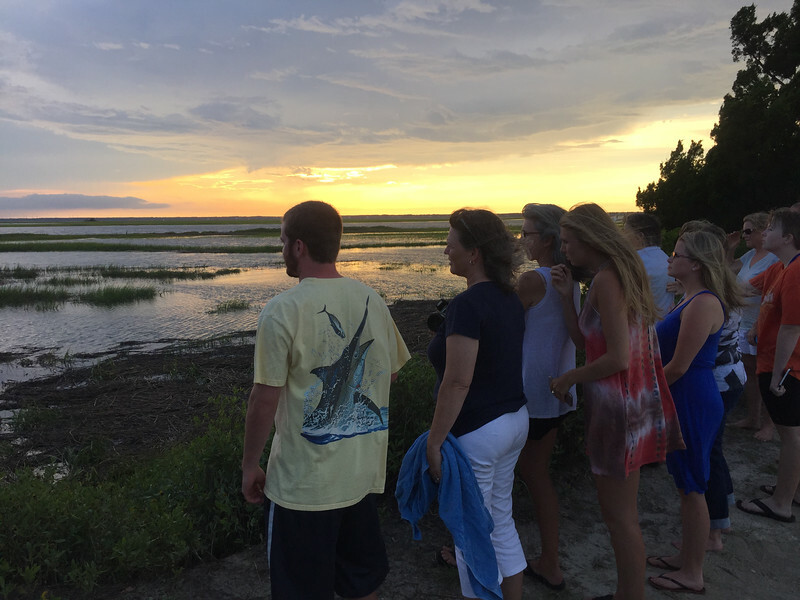 It was a typical Dewees evening: neighbors gathered to watch the manatees, and stayed despite a short rainstorm. There were audible gasps when two surfaced face to face. When there’s a fascinating wildlife activity, our Dewees Island roads often look like Yellowstone with cars stopping to watch bears along the highway, and last night was no exception. 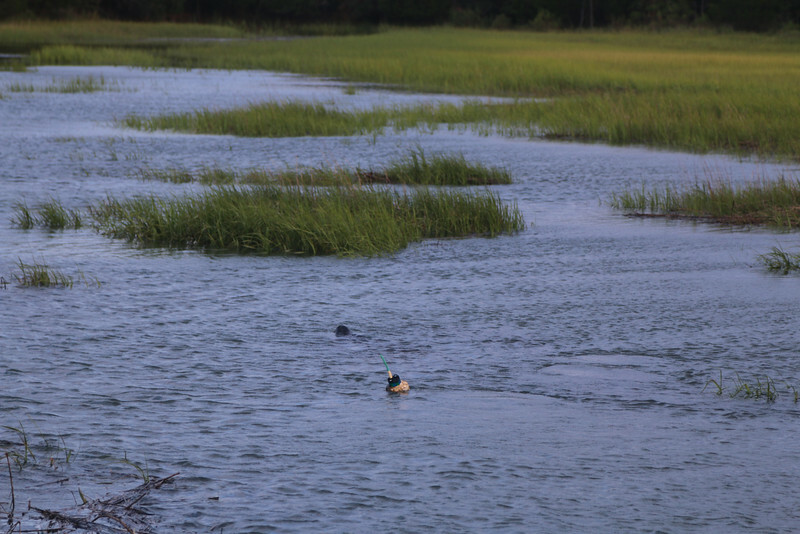 We watched as Goose and his friends explored the very shallow marsh on a king tide, and then made their way back to the main channel and slipped out to sea. 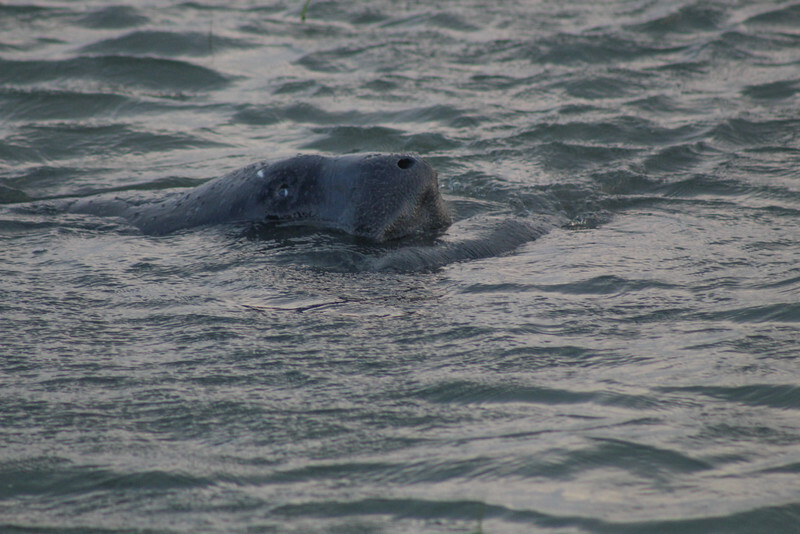 Manatees have shown up on Dewees in past summers: we reported them in the waves (also during July 4 celebrations) in 2010, and in 2011 Captain Rick got photos of manatees in the water at the marina. And after posting our sightings on this blog and on facebook, we heard from others who had spotted Goose this weekend. 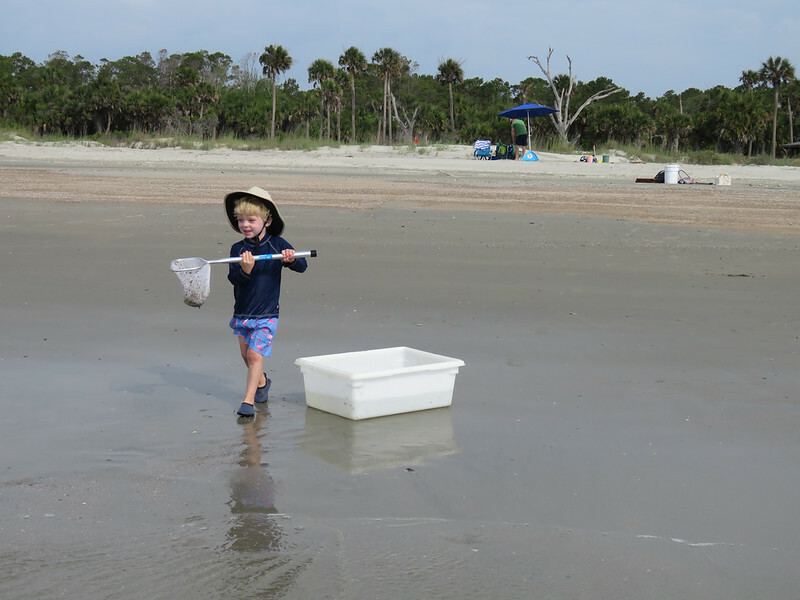 At James Island on July 3, as well as at the City marina. This means that Goose came from Charleston Harbor to Dewees on one of the busiest boating days of the year! Perhaps the marker makes Goose easier to see and avoid. It’s a good reminder to keep alert when you’re driving a boat! Manatees surface for air like dolphins do, but also leave a sort of footprint: a series of round rings on the surface of the water that signify a manatee right below the surface. If you spot Goose or any other manatee, you can enter the details on this form. If you see Goose, don’t touch him or the buoy: it may disconnect the transmitter and ruin all the research associated with it. In addition, if you are on a dock and you’re running fresh water that attracts a manatee, turn the water off. Inviting managees to come closer to people and boats puts them at risk! Look around for manatees before cranking your boat’s motor. Please heed “slow speed,” “no wake” and manatee warning signs, especially around docks. Watch for large swirls in the water called footprints that may be caused by manatees diving away from the boat.